Pull a 5th Wheel Trailer with a Gooseneck Hitch! 5th Wheel to Gooseneck Hitch Adapter: Pull Your 5th Wheel Trailer with a Gooseneck Hitch! This product is the strongest and easiest to install 5th Wheel to Gooseneck adapter made. 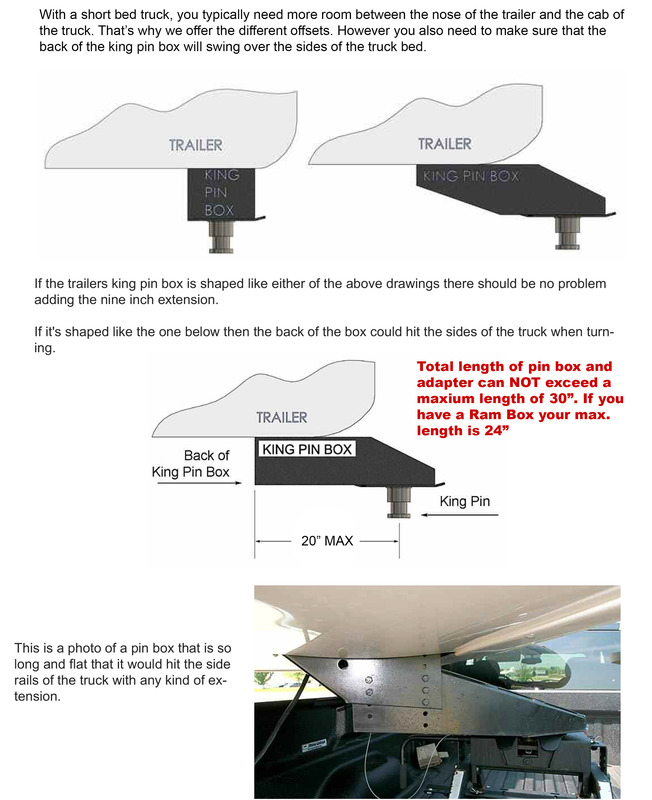 Our adapters let you tow your 5th Wheel (king pin) trailer with a Standard 2-5/16" ball gooseneck hitch. Extended models allow shorter turns, especially needed with short bed trucks. The extended models give you an additional clearance between your tow vehicle cab and the trailer nose, and between the tow vehicle tailgate and the trailer bulkhead. This gives you more clearance for additional trailer swing radius and more room for trailer hook-up. The extended 5th wheel to gooseneck adapters create less than 100 pounds less tongue weight on your tow vehicle, which will not change your towing experience. The RV adapters have a Durable black Powder coated finish, easy bolt-on installation, 24,000 lbs. Gross Trailer Weight, and 6,000 lbs. Gross Tongue Weight. These adapters fit standard king-pin boxes and have self-latching couplers, and all gooseneck trailer couplers are fitted with premium “self-latching gooseneck trailer couplers” for the standard 2-5/16 gooseneck ball. The coupler has a molded hitching guide to make coupling easier and latches when the trailer is lowered onto the ball. To uncouple, you simply pull a release cable located near the trailer jack handle. The smooth precision coupler extends ball life. The couplers have a molded hitching guide for easy coupling, and are precision cast using Chrome Vanadium Steel with a Stainless steel latching pin and a stainless steel spring. The couplers carry a V19 rating of 28,000 pounds and was tested to 42,000 pounds to gain this rating. The RV1, RV2, RV3 models of these versatile adapters have 4 inches of height adjustment in 1” increments from 12.5" to 16.5" measured from top of ball to king pin plate to accommodate different height trucks and trailers. The versatile RVCC Cushion gooseneck adapter has 4 inches of height adjustment in 1” increments from 13.5" to 17.5" measured from top of ball to king pin plate to accommodate different height trucks and trailers. The RVCC is an extended cushioned 5th wheel to gooseneck adapter that gives you additional 7-1/2 inches clearance between your tow vehicle cab and your 5th wheel trailer nose, and between the tow vehicle tailgate and your 5th wheel trailer bulkhead. This gives you more clearance for additional trailer swing radius and more room for trailer hook-up. These cushioned gooseneck trailer couplers have a vertical cushion inside the vertical tube and a round horizontal progressive shock dampening cushion just above the coupler. The couplers are mechanically cushioned and does not have the maintenance an air-cushion has. The RV4 & RV4XL models are for flatbed trucks. They have a 9 inch extension and come in two fixed heights. The RV1 has a 5 inch extension. The RV2 has a 9 inch extension. The RV3 has zero off-set (straight). The RVCC is a cushioned adapter with a 7-1/2 inch extension. The RV4 is for a flatbed truck with 7-1/2 inches from the top of your gooseneck ball to your kingpin plate on your trailer and has a 9 inch extension. The RV4XL is for a flatbed truck with 11-1/4” inches from the top of your gooseneck ball to your kingpin plate on your trailer and has a 9 inch extension. RV2 / RV226 Lower unit with 9 inches extension. Used with a RV1, RV2, or RV3 upper unit. RVCC / RV230 lower unit to be used with a RV1, RV2 or RV3 Upper unit. **All but a few kingpin boxes allow for extended (off-st) adapters but a few kingpin boxes are made with the kingpin plate going so far back on a level plane that it will not work with some or all extended adapters and can hit the inside of your pickup bed sides. See below for more detailed information.